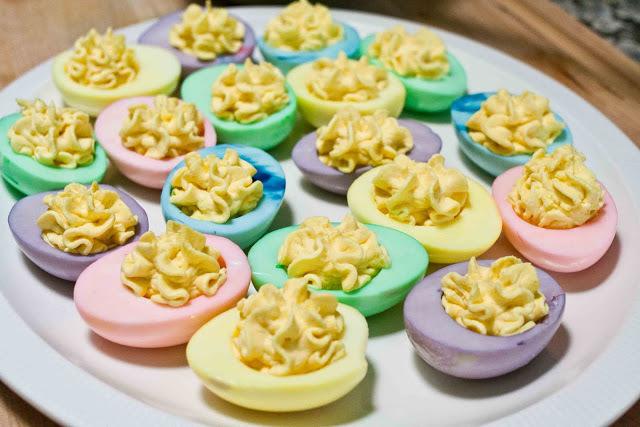 Now that the Easter Egg hunting season is upon us, you may be looking for something to do with the all of the extra eggs that don‘t make it into the baskets. Have I got a recipe for you! I can’t take credit for this idea – I found this over at the website “Foodjimoto“. They have very detailed instructions on how to make these over there, so please refer to their site if you have any questions. These are bound to be very popular with your guests, so you may want to double (or triple) the recipe. 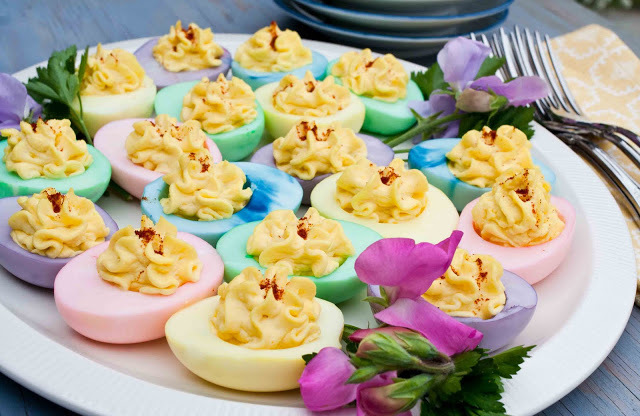 And don’t worry about the vinegar that is used in the dying process – the flavor doesn’t get absorbed into the egg whites, so you can leave them in the dye bath until they reach the desired color. 1. 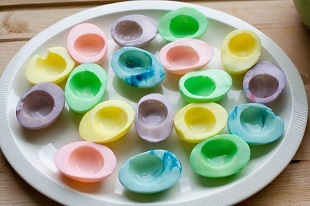 Add the eggs to a medium pot and fill with cold water until the eggs are just covered; place over moderately high heat. When the water comes to a boil, turn off the heat, cover the pot with a lid and set a timer for 10 minutes. 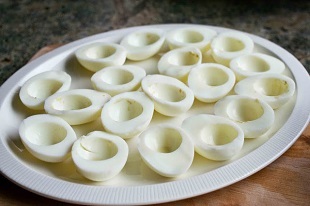 At the 10 minute mark, transfer the eggs to a bowl with cold water and rinse until they reach room temperature. 2. Peel the eggs and slice them in half. 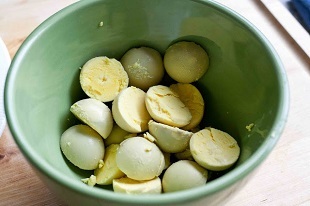 Carefully remove the egg yolks from each halved egg and place in a bowl. Set bowl aside. 3. Put water in several clear glasses. Add 1-2 teaspoons of cider vinegar to each glass to help the dye transfer. 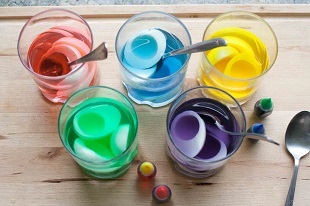 Add food coloring to each glass until the desired color is reached – 2-3 drops for pastel colors, more for intense colors (feel free to mix drops to get different shades of colors, like orange and purple). 5. 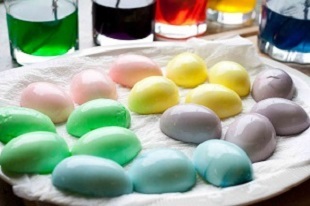 While eggs are drying, make the filling. Mash egg yolks until they are nice and crumbly. Add in 1/4 cup of mayonnaise, then blend until smooth. 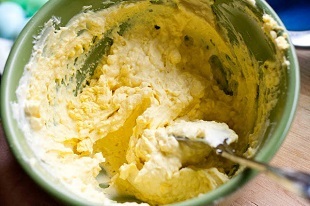 Continue adding mayonnaise by tablespoons until the desired consistency is reached. 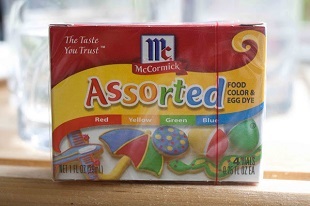 Add in any extra ingredients to your family’s tastes, or leave plain. Season with salt and/or pepper to taste. 6. Remove egg whites from paper towels, arrange cut side up for filling. Spoon or pipe the egg mixture into the cavities of the egg whites. Garnish, if desired. Sprinkle paprika on top of each egg and serve. 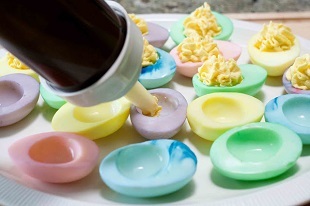 This entry was posted in Foodie Friday, Holidays, Just Because, Recipes and tagged Deviled Eggs, Easter, Green Eggs and Ham. Bookmark the permalink.